Malware Forensics Field Guide for Linux Systems is a handy reference that shows students the essential tools needed to do computer forensics analysis at the crime scene. It is part of Syngress Digital Forensics Field Guides, a series of companions for any digital and computer forensic student, investigator or analyst. Each Guide is a toolkit, with checklists for specific tasks, case studies of difficult situations, and expert analyst tips that will aid in recovering data from digital media that will be used in criminal prosecution. This book collects data from all methods of electronic data storage and transfer devices, including computers, laptops, PDAs and the images, spreadsheets and other types of files stored on these devices. It is specific for Linux-based systems, where new malware is developed every day. The authors are world-renowned leaders in investigating and analyzing malicious code. 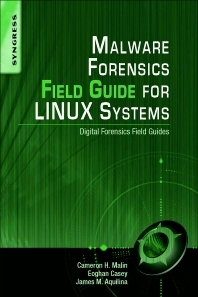 Chapters cover malware incident response - volatile data collection and examination on a live Linux system; analysis of physical and process memory dumps for malware artifacts; post-mortem forensics - discovering and extracting malware and associated artifacts from Linux systems; legal considerations; file identification and profiling initial analysis of a suspect file on a Linux system; and analysis of a suspect program. This book will appeal to computer forensic investigators, analysts, and specialists. Cameron H. Malin is a Certified Ethical Hacker (C|EH) and Certified Network Defense Architect (C|NDA) as designated by the International Council of Electronic Commerce Consultants (EC-Council); a GIAC Certified Intrusion Analyst (GCIA), GIAC Certified Forensic Analysis (GCFA), a GIAC Certified Incident Handler (GCIH), GIAC Certified Reverse Engineering Malware professional (GREM), GIAC Penetration Tester (GPEN), and GIAC Certified Unix Security Administrator (GCUX) as designated by the SANS Institute; and a Certified Information Systems Security Professional (CISSP), as designated by the International Information Systems Security Certification Consortium ((ISC)2®). From 1998 through 2002, Mr. Malin was an Assistant State Attorney (ASA) and Special Assistant United States Attorney in Miami, Florida, where he specialized in computer crime prosecutions. During his tenure as an ASA, he was also an Assistant Professorial Lecturer in the Computer Fraud Investigations Masters Program at George Washington University. Mr. Malin is currently a Supervisory Special Agent with the Federal Bureau of Investigation assigned to the Behavioral Analysis Unit, Cyber Behavioral Analysis Center. He is also a Subject Matter Expert for the Department of Defense (DoD) Cyber Security & Information Systems Information Analysis Center and Defense Systems Information Analysis Center. Mr. Malin is co-author of the Malware Forensics book series, Malware Forensics: Investigating and Analyzing Malicious Code, the Malware Forensics Field Guide for Windows Systems, and the Malware Forensics Field Guide for Linux Systems published by Syngress, an imprint of Elsevier, Inc. The techniques, tools, methods, views, and opinions explained by Cameron Malin are personal to him, and do not represent those of the United States Department of Justice, the Federal Bureau of Investigation, or the government of the United States of America. Neither the Federal government nor any Federal agency endorses this book or its contents in any way. Eoghan Casey is an internationally recognized expert in data breach investigations and information security forensics. He is founding partner of CASEITE.com, and co-manages the Risk Prevention and Response business unit at DFLabs. Over the past decade, he has consulted with many attorneys, agencies, and police departments in the United States, South America, and Europe on a wide range of digital investigations, including fraud, violent crimes, identity theft, and on-line criminal activity. Eoghan has helped organizations investigate and manage security breaches, including network intrusions with international scope. He has delivered expert testimony in civil and criminal cases, and has submitted expert reports and prepared trial exhibits for computer forensic and cyber-crime cases. In addition to his casework and writing the foundational book Digital Evidence and Computer Crime, Eoghan has worked as R&D Team Lead in the Defense Cyber Crime Institute (DCCI) at the Department of Defense Cyber Crime Center (DC3) helping enhance their operational capabilities and develop new techniques and tools. He also teaches graduate students at Johns Hopkins University Information Security Institute and created the Mobile Device Forensics course taught worldwide through the SANS Institute. He has delivered keynotes and taught workshops around the globe on various topics related to data breach investigation, digital forensics and cyber security. Eoghan has performed thousands of forensic acquisitions and examinations, including Windows and UNIX systems, Enterprise servers, smart phones, cell phones, network logs, backup tapes, and database systems. He also has information security experience, as an Information Security Officer at Yale University and in subsequent consulting work. He has performed vulnerability assessments, deployed and maintained intrusion detection systems, firewalls and public key infrastructures, and developed policies, procedures, and educational programs for a variety of organizations. Eoghan has authored advanced technical books in his areas of expertise that are used by practitioners and universities around the world, and he is Editor-in-Chief of Elsevier's International Journal of Digital Investigation. James M. Aquilina, Esq. is the Managing Director and Deputy General Counsel of Stroz Friedberg, LLC, a consulting and technical services firm specializing in computer forensics; cyber-crime response; private investigations; and the preservation, analysis and production of electronic data from single hard drives to complex corporate networks. As the head of the Los Angeles Office, Mr. Aquilina supervises and conducts digital forensics and cyber-crime investigations and oversees large digital evidence projects. Mr. Aquilina also consults on the technical and strategic aspects of anti-piracy, antispyware, and digital rights management (DRM) initiatives for the media and entertainment industries, providing strategic thinking, software assurance, testing of beta products, investigative assistance, and advice on whether the technical components of the initiatives implicate the Computer Fraud and Abuse Act and anti-spyware and consumer fraud legislation. His deep knowledge of botnets, distributed denial of service attacks, and other automated cyber-intrusions enables him to provide companies with advice to bolster their infrastructure protection.